Some people have been asking about the lyrics, if you buy the CD as a digital download you don't get a copy of them as you do if you buy a physical CD, however, you can now read the lyrics, on this new lyrics page. This is still a work in progress, so they aren't all up yet, it's taking me a while to read them from the tiny gold on black fancy font from my original pressing of the CD, so bear with me, but I'm chipping away at it. 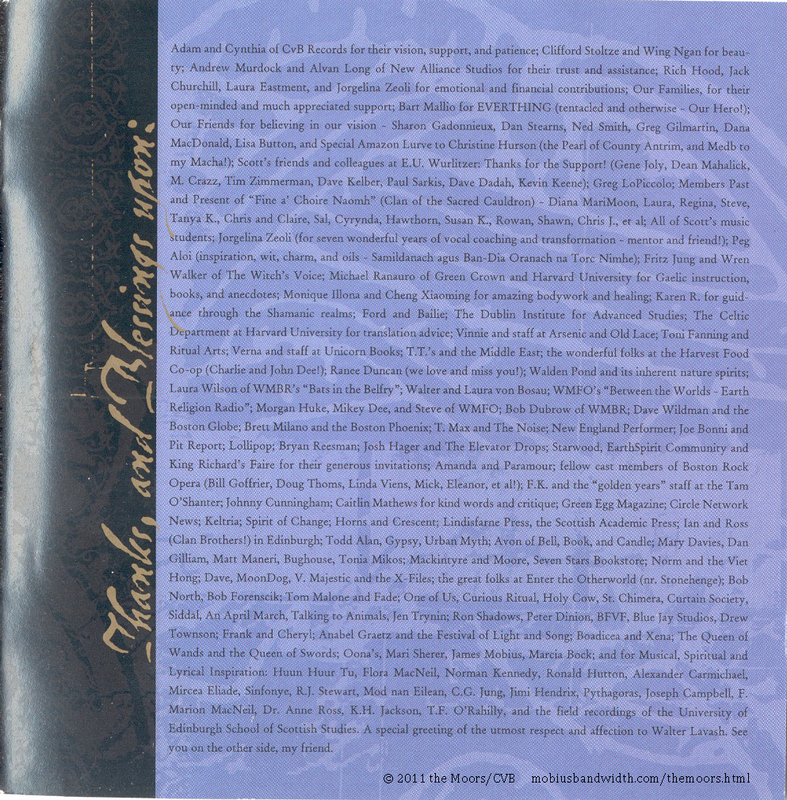 I have also posted scans of the original edition booklet from Castle Von Buhler records on this page, and I'm typing up the liner notes for the songs. Scroll down for scans. Here then are the lyrics in order of appearance on the CD. so shall ever be, (shall) ever be. of WInd, Moon and Nature Spirit. Witch of viper and lightning. Numerous attempts over time to subdue and weaken Celtic culture began with the Roman military occupation of Celtic lands. Despite my ethical response to their efforts, the lyrics for this song came to me in Latin, at the end of a dream. I see it as an incantation intoned by a Celtic Priestess or Druidess, using the language of the intruders themselves to intensify the oppositional and protective magic. She wields the powers of the elements to preserve the religion and culture of her people, and to protect the wisdom and traditions of the Druids (who suffered persecution at the hands of the Romans, though it was political, rather than religious, in nature). May the power of the Moon, the NIght, and the Sacred Female Energies, together in harmony with the Sun, the Day, and the Sacred Male Principle, once again be honoured and celebrated! I shall not be put in cell, I shall not be torn in sunder. Nor will the Queen touch me. Nor will she harm me. Brigit of the Fairy Woman. No mon shal burn me. No water shall drown me. Notes: Bridget, the ancient Celtic Goddess of Poetry, Healing and Smithcraft was highly revered by our ancestors, and honoured at Imbolc (Feb. 1), a holiday marking the birth of the tribe’s sheep, essential for their milk, meat and wool. It was said that the ocean became warm on that day as Bridget, also associated with fire, put her hand into the water. At Imbolc, she was welcomed into the family home, and many wonderful customs were maintained when she was later venerated as St. Bridget, the daughter of a druid. 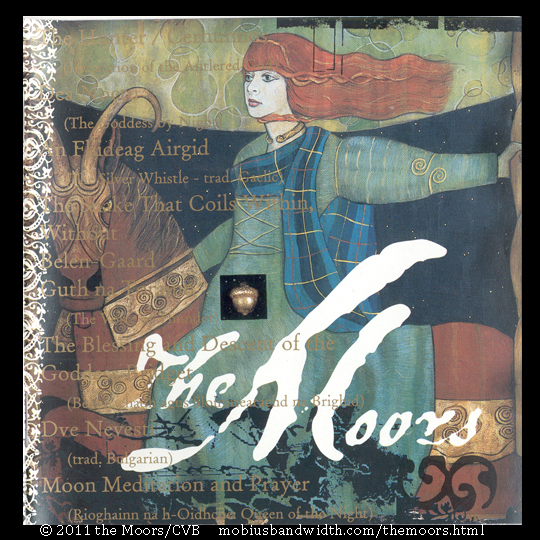 She is much beloved in Ireland and Scotland, her powers as Goddess and saint interwoven still. “The Descent of Bridget” is a chant of protection, which we have adapted to include her many ancient attributes. The last three stanzas are mysterious verses often repeated on An Fhéill Brighid, The Festival or Feast of Bridget. 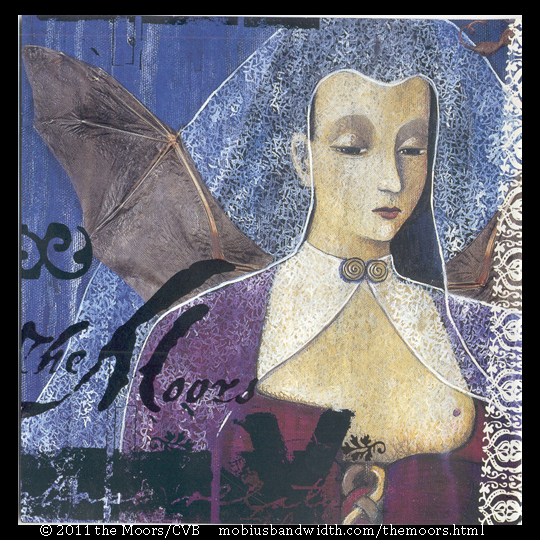 Copyright © 2011 the Moors. Adaptation of Traditional Highland Incantation, additional poetry and Translations by Sharynne NicMhacha. 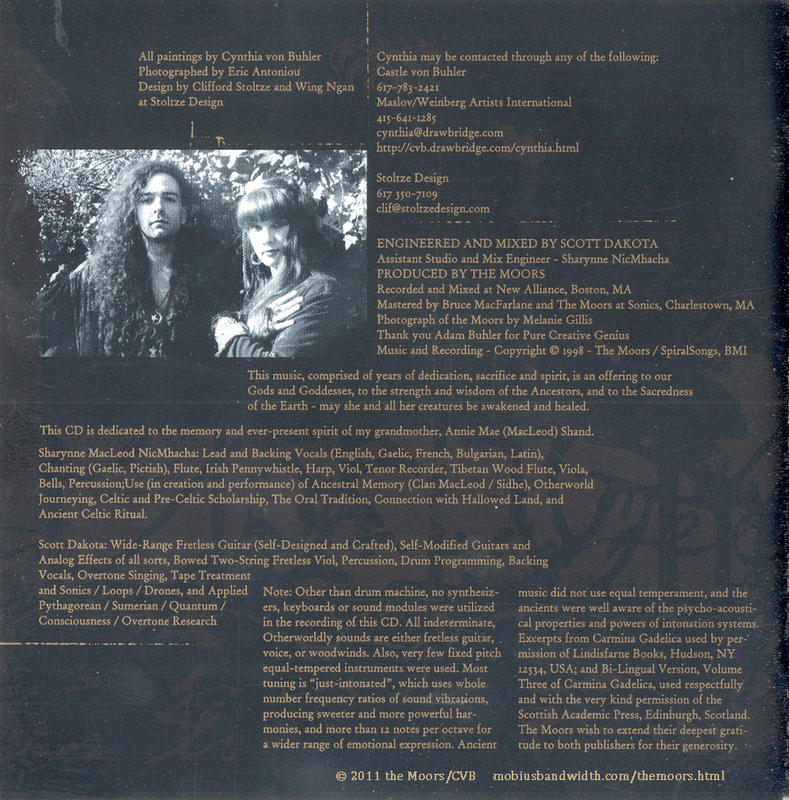 Flip through the original CD booklet, click pics to enlarge.